Lucy Harrison sells books by day and volunteers with the Cypress Hollow fire department by night. Her life is just the way she likes it—full, even-keeled, and smooth—until bad-boy ex-cop Owen Bancroft comes back to town. Lucy has always been fearless, never scared about diving in to help others. When it comes to risking her heart, however, she realizes she’s absolutely terrified. In a small town like Cypress Hollow, everyone knows your business—and there is nowhere to hide. Then Lucy and Owen are thrown together by the discovery of the lost work of local legend, knitting guru Eliza Carpenter. Now Owen, adrift and struggling to redefine himself as a civilian without a badge, will have to learn how to open himself up to life’s new possibilities . . . while Lucy decides just how much of herself she’s willing to gamble on love. Rachael Herron received her MFA in writing from Mills College, and has been knitting since she was five years old. It’s more than a hobby; it’s a way of life. Lucy’s grandmother Ruby has had an enormous influence over Lucy’s life. Can you argue that Lucy was ever held back because of her love for her grandmother? If so, was that eventually worthwhile? If not, why not? 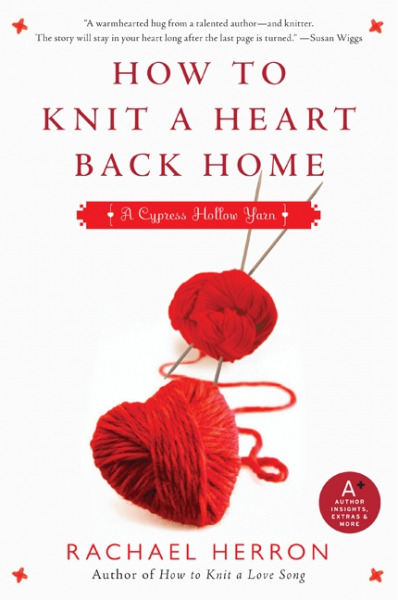 How has living in a small town like Cypress Hollow shaped Lucy? How has it made her strong, and what are some drawbacks to growing up in an area where everyone knows your name? Owen ran away from Cypress Hollow once, and has returned because of his ailing mother. Would he have come back, were it not for her? Or do you think it’s predetermined that he and Lucy would be together? How does Owen’s injury affect his own self-image? Is the way he sees himself justified? He’s still bitter about how he was injured—is this a healthy attitude? Will he always see himself as an officer of the law, or is this an identity he will be able to let go of? Owen’s relationship with his mother is complicated, and he’s not sure he’s handling any of it the right way. Discuss whether you think he is—what could he have done better with his mother? Do you think he should have put her in the care home? What if she hadn’t made it off the lighthouse ledge? What would his responsibility for this incident be? Lucy’s mother Toots is almost the polar opposite of Irene, Owen’s mother. How is this portrayed in the book? How do you think the different mothering styles are manifested in their children? Should she have kept the letter from her daughter? Molly, Lucy’s best friend, is described as being daring and sexually confident. Why do you think Molly is such an entrepreneur, seemingly unable to settle on one career? What does this friendship give Lucy? What are their similarities? Their differences? Do you think Molly ending up with Jonas is the right thing for her? Mildred and Greta have a secret that isn’t revealed until the end of the book. Did you figure it out before Lucy did? What does this say about Lucy, that she never realized how their relationship worked for so many years? Do you think Lucy will notice more about other people now? Knitting, of course, plays a huge role in Lucy’s life. Who do you think she would be without it? Eliza Carpenter is the figure behind the curtain. Do you think she really put Owen and Lucy together? Or is that just something they wish happened? How do the Eliza Carpenter epigraphs at the beginning of each chapter influence your reading? And how does the discovery of more of her writing affect the tone of the novel in full?